There is an increased demand for Building Commissioning Services. Quicx Commissioning Software can help you become more efficient in building your commissioning services business. Don't drown in a sea of spreadsheets. 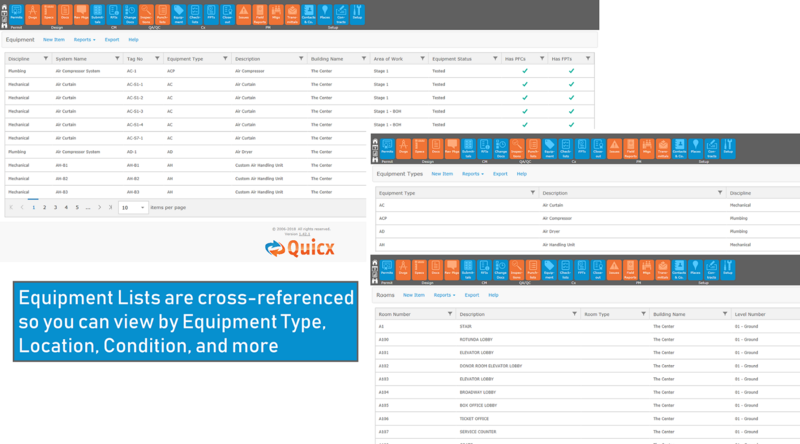 Quicx helps track all the equipment at a facility – plus cross-reference Equipment Lists by location and commissioning test status. Make sure your commissioning agents are using the up-to-date versions. See the condition and depth of your PFCs and FPTs. Simplify distribution. They are all online. What does your commissioning audit trail look like? Does each piece of equipment in the facility have a test summary, a history of when it was tested, who tested it, and test results – or is a Pass/Fail result all you and your clients deserve? Quicx saves test results to help manage project progress and status. The test history supports follow up inquiries, warranty reviews, deferred or seasonal testing, and quality assurance. Increased Collaboration between design and construction teams, owners, subcontractors, and building equipment suppliers. Quicx establishes a digital hub for your entire project team. 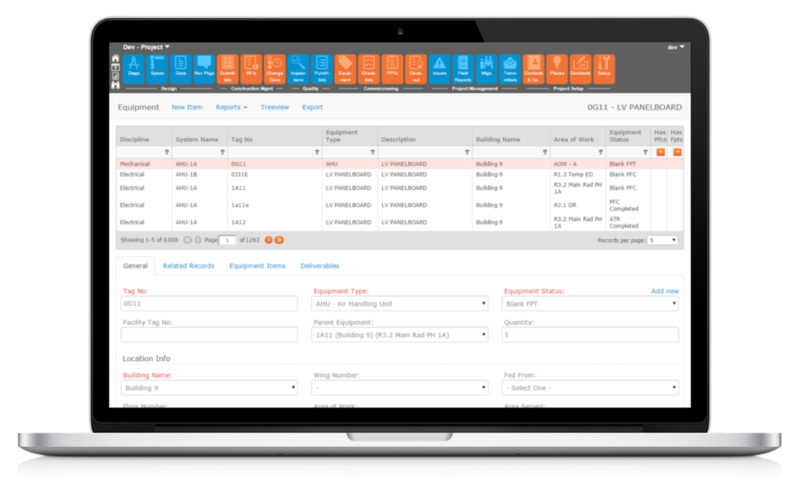 With Quicx, you have a platform for storing, distributing, and tracking Transmittals, Submittal Packages, and RFIs. Integrated features offer a better way to respond to RFIs, including photo and documentation attachments. Quicx is a particularly cost-effective solution when one considers other approaches, from manually managing files and emails to licensing and customizing generic online collaboration tools. Digital communication and online collaboration is great, but sometimes face-to-face meetings are necessary – including those conducted through video conferencing and conference calls. Use Quicx to make your meetings run better. What methods does your team use to store and access Commissioning Plans and Owners Project Requirements? Do these processes vary by project? Licensing yet another third-party tool to cobble together a solution? Quicx includes Document Management tools so you can easily upload and access project documentation. Don't let Security Protocols or a Weak Signal in the field slow you down. Quicx functionality for importing and exporting – including Data Input Validation Checks – embraces the ways spreadsheet applications are oftentimes used while performing commissioning activities. Quicx Commissioning Software features a native iOS app that runs offline on your iPad. Commissioning checklists are available offline, and data collected in the field synchronizes when you go back online. Printable input forms and checklists are a low tech but undeniably reliable option when on site for a commissioning project. Quicx bulk printing operations make this option easy. Tell us about yourself, your needs, and what about Quicx grabs your attention. We’d be happy to tell you more and send you a proposal!